Runny nose, itchy eyes, and the infuriating sensation of not being able to sneeze? Pollen count is on the rise as the weather warms up which means one thing – allergies. When it comes to home remedies for allergies you hear a lot about local raw honey preventing them. 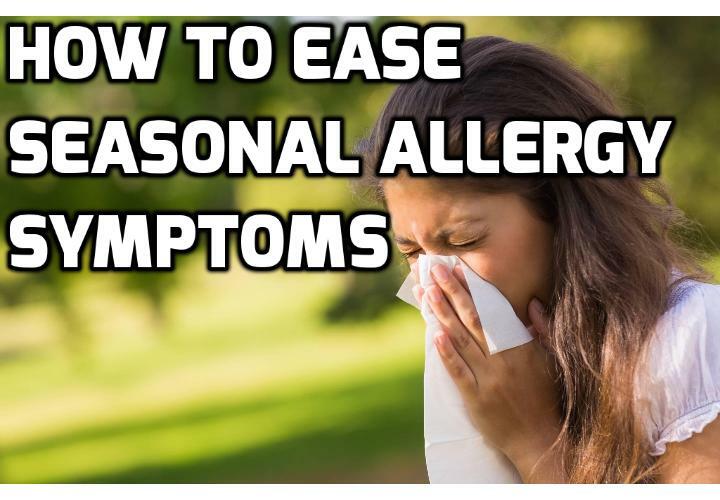 It is supposed to work because the gradual intake of local pollen will help build up your immunity before the symptoms start, thereby providing relief when the season actually hits. And while it does work for some people, let’s not forget that there are plenty of remedies you can try at home to help relieve the common symptoms of seasonal allergies. As a Minnesotan I intend to soak up every last bit of warm weather, especially after our brutal winter, and I’ll be utilizing a number of remedies to help fight any allergies dragging me down. The peppermint contains a type of flavonoid called luteolin-7-O-rutinoside which can help inhibit the activity and secretion of anti-inflammatory enzymes, such as histamines, and greatly reduce the dreadful discomfort that comes along them. If local honey isn’t doing the trick for you, try bee pollen. The same concept lies behind how it works – starting in small amounts and gradually increasing the dosage daily will help build up your immunity to the pollen in your area. This is a play off what is known in medicine as “the hygiene hypothesis”, in which childhood exposure to germs and bacteria are vital to developing an immune system that can handle those same things down the line. Here you expose yourself to allergens before allergy season so your system doesn’t take a huge blow when the air fills with pollen. There are two vital parts to this remedy – first, make sure you are not anaphylactic or severely allergic to bees, or so allergic to pollen that you experience anaphylaxis. Second, get local pollen. This will not work unless the pollen is local, as you need to build up a tolerance to the plants in your area. You also need to make sure that your pollen is coming from a good source, and free from insecticides. There are 3 forms (granules, capsules, and powder) but I prefer granules. Bee pollen is crunchy, musty, and very floral-enjoy it plain or sprinkle some over yogurt or oatmeal in the morning! Start taking pollen 5 months before your allergies flare (so February if they start in May, for example.) Start with 1 or 2 granules under the tongue and let them dissolve or chew them. The next day increase the dosage by 1 granule. Continue this until you feel confident that you will not have a reaction (I recommend doing this for about 2 weeks.) If you experience no adverse reaction, you can take up to 1 tablespoon daily throughout allergy season. Since many allergies peak in the spring and summer, they happen to coincide with warm, sunny days that you want to enjoy by frolicking in the great outdoors. As healing as tea is, sometimes you just need that tart, cool, refreshing drink at your side. This citrus filled drink contains plenty of vitamin C, which can provide relief from seasonal allergies, thanks to its incredible ability to nourish the immune system. Since the immune system is struggling to function right when you experience allergies, the benefits of this are obvious! Onions contain a water soluble chemical compound called quercetin, which has been demonstrated in preliminary studies to reduce the amount of histamine produced by the body, therefore reducing symptoms of allergies. It is, essentially, nature’s version of an anti-histamine. Quercetin itself has also been shown to inhibit inflammation, as well as act as a bronchodilator, opening up airways and helping you breathe easier. This mix will help you hit the trail in no time, without the sneezing and itching. Walnuts are a daily snack that you can enjoy to help ease allergy symptoms. High in magnesium, they help tamp down any wheezing or coughing that’s taking place, while their vitamin E content can boost immunity and protects your body from reacting to allergens. Apples, like onions, contain quercetin, and naturally reduce the production of histamine. Several studies have confirmed that an apple a day really does keep allergies at bay. You can also watch this Video HERE to learn about other home remedies for seasonal allergies. -If you simply must open your window, don’t fling it open all the way. Allergens will fly into the house and settle on everything. -At the end of the day, briefly rinse off with cool water. Doing so will rinse any pollen stuck in your hair or on your skin off, and also ensures you don’t transfer a bunch to your bedding!